I have a lot of strengths that I'm grateful for- creativity, compassion & friendship. Unfortunately, calmness is not one of them. Though I've gotten much better over the years, I'm a worrier to my core. I lay in bed at night making mental to-do lists, stressing out at work over deadlines and presentations and have trouble "turning off" my brain. Thankfully, I've also figured out some ways that help you keep your cool, put things back in perspective, and unwind. 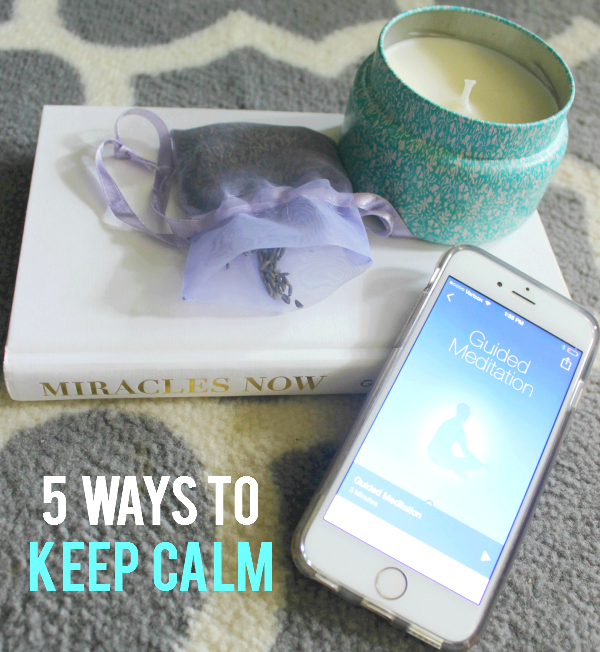 I know I can't be the only one who can use a little more relaxation in their life- so, I'm sharing 5 ways to keep calm and combat stress. 1. Mindfulness App - I just downloaded The Mindfulness app this week and it's resulted in best night's sleep I've had in a long time. It allows you to select guided meditation's for varying durations of time. I'm not going to lie, meditation always sounded pretty hippie dippie to me, but, it's really just a technique to help you turn off your brain and focus on your breathing. You can even do it in the middle of the day at your desk to help you press reset when you're getting stressed. 2. Light a Candle- If you follow me on Instagram you'll see that I always love lighting candles while I work, which makes it feel more spa-like than office-like. Choose a scent that instantly puts you in a happy state of mind, for me, it's Capri Blue's tropical scents that if you close your eyes, almost make you feel like you're on a beach in Hawaii instead of at a desk. 3. Learn to Love Lavender: My mom made me a purple sachets with dried lavender that I keep by my bedside. This herb is known for its relaxing effects. You can also get a lavender linen spray to put on your sheets for a calm and sleepy bed time. 4. Read a Book: Instead of binge watching Netflix before bed (guilty! ), unplug your electronics and pick up a book. I prefer a fiction read to let yourself get lost in the characters! I'm a sucker for Nicholas Sparks (reading The Longest Ride right now after picking it up at the airport), but love looking to my friend and avid reader, Joyce for reccomendations. 5. Listen to Music: Listening to music that's either in another language or instrumental to is one of the quickest ways to help you focus and calm your mind. The words can't distract you if you can't sing along which is especially helpful while studying or working. I like music in a foreign language (like Spanish guitar crooning), classical music, or opera when I need to feel instantly chill. These are just a few simple fixes to help you keep calm & combat stress but I'm also a fan of aromatherapy massages, yoga classes and quiet afternoons in nature. Gabby Bernstein's book, "Miracles Now" also offers a ton of great tactic for relaxation and fighting stress! What are your favorite was to de-stress and relax? I've been a bit stressed lately. I definitely needed to read this. I find sitting down with a good book is always really helpful. I used to think meditation was hippie dippie too, but I've started doing it more regularly after I had my first ever panic attack and oh man, it's a life saver! SO helpful with stress and a really good way to learn about yourself.